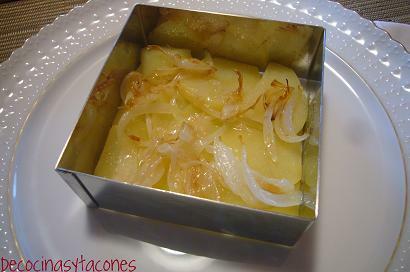 El milhojas de patata y bacalao es facilísimo de hacer. 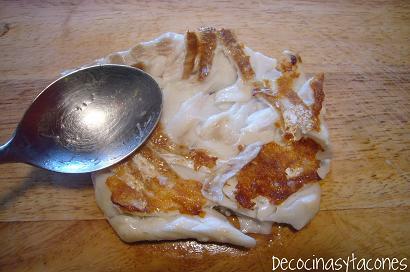 Yo lo he hecho esta vez con bacalao fresco. La decisión de último momento de hacer este plato, no me ha permitido comprar el bacalao salado y desalarlo. 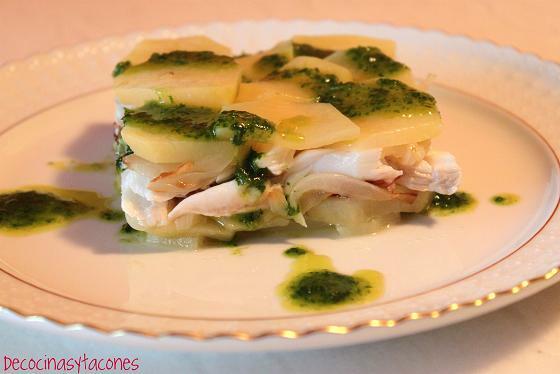 Yo personalmente prefiero hacerlo con bacalao desalado, pero tengo que admitir que estaba buenísimo. 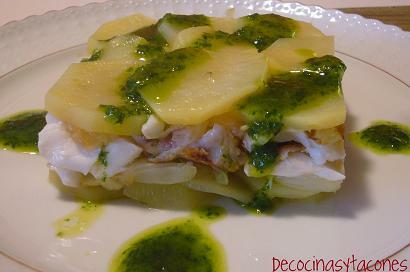 The potatoes and cod millefeuille, is very easy to make. I´ve done it with fresh cod this time, a last minute decision to make this dish, hasn´t allowed me to buy salt cod and have enough time to soak it in water. For this dish, I personally prefer the salt cod, but I have to admit it was really good. No podía ser más sencillo. Se cuecen al vapor las patatas, cortadas como en la foto de aquí debajo. 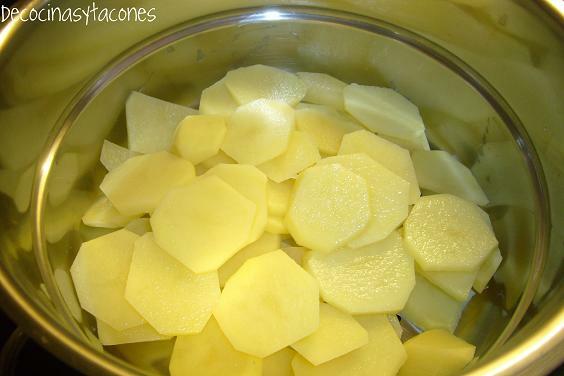 Cut the potatoes as they are shown in the picture, and put them in a steamer. Steam them for 10-15 minutes. Pochar las cebollas lentamente.Primero las lavamos. Cook the onions very slowly. I wash them first. En una sartén, hacer el bacalao en su punto (marcarlo) y cuando esté, aplastarlo con la mano o con una cuchara haciendo un movimiento giratorio para que salgan las láminas enteras. Pan-fry the cod until just cooked through. When it´s done, put it on a board, press it with the heel of your hand or with a spoon and with a round movement, fan out the cod flesh, it would separate into perfectly flaked layers. Cortar las cebolletas en juliana, y lavarlas en el grifo para quitar el sabor amargo (esto lo aprendí de David de Jorge. http://www.daviddejorge.com/). Hay que secarlas bien antes de ponerlas en la sarten. Se pochan las cebolletas lentamente. 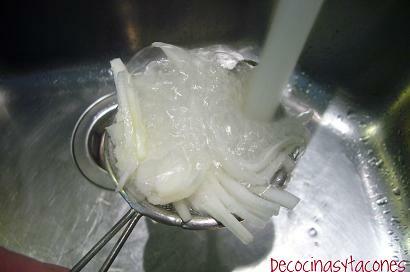 Cut the onions in length, and "clean" them under water. 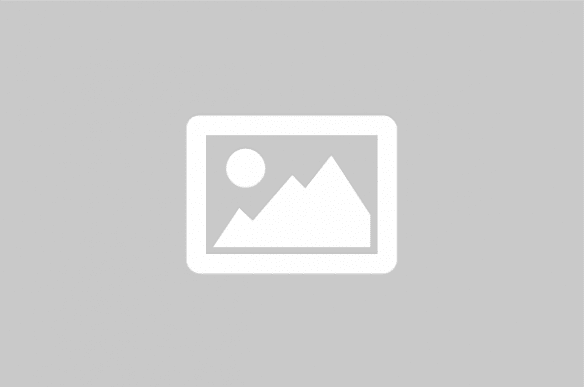 I learned this from David de Jorge http://www.daviddejorge.com/. You have to dry them carefully before putting them on the pan. 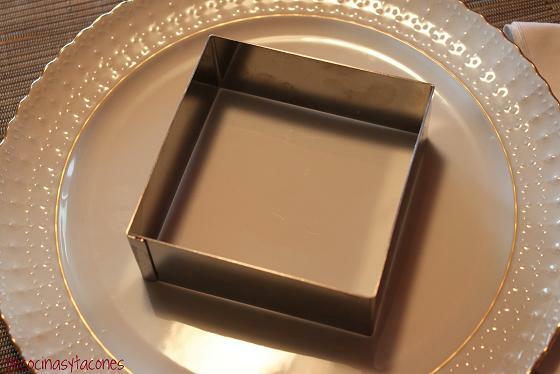 En el molde sobre el plato montamos el milhojas. Now in the mold and on the plate we assemble the millefeuille. Empezamos con la patata y después la cebolleta. Seguimos con el bacalao y después, cebolleta otra vez. 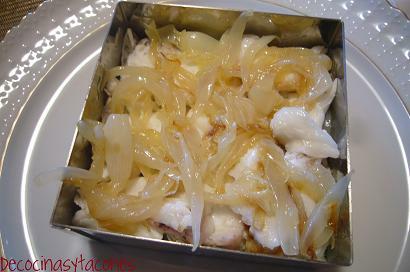 We go on with the cod, and again another layer of onion. 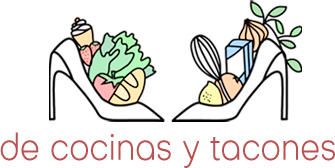 Para terminar con otra capa de patatas. To finish, we end up with a layer of potatoes. Hacemos la vinagreta de perejil. En la batidora, ponemos 3 partes de aceite de oliva con una parte de vinagre de sidra. Now, we prepare the vinaigrette with three parts of olive oil and one part of cider vinegar. We put both in a food processor together with the parsley. Añadimos el perejil y lo batimos hasta que trituramos el perejil. Echamos por encima del milhojas para adornar. To finish, drizzle the millefeuille with the parsley vinaigrette.